Recently I had a need to reacquaint myself with the latest Kinect SDK. v1.6 has just been released and is downloadable from here Kinect SDK. So I downloaded it and started playing around with some code and it occurred to me that what I would really like was an environment in which I could use the Kinect in a metro application. Using the Kinect SDK from a metro app is not a supported scenario and neither is communication between a metro app and a desktop app. Having said that, I recall reading somewhere that someone may have used a wcf service to carry out this communication so I guessed that a local socket connection would probably work (I believe this is an unsupported mechanism and would likely fail store certification). My goal was not to release an app but just to be able to make use of it for experimental/personal usage. The first thing was to get a communication path between a metro app and windows 8 desktop app. I followed the instructions here to enable WinRT in a desktop app. Then, I copied the server side of the socket code and the xaml into a WPF app. With a few minor adjustments (replacing OnNavigatedTo event handler and MessageDialog) it was good to go.. So, the next step is to configure the wpf application to respond to Kinect voice commands and ship them over the socket. 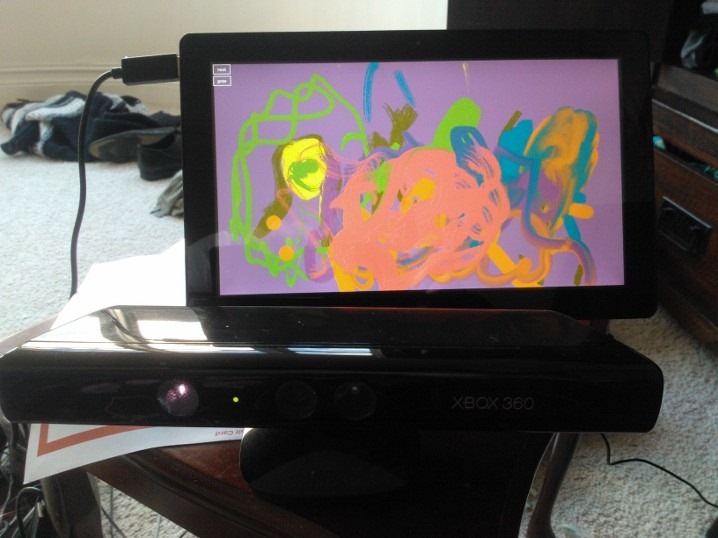 Add code to carry out speech recognition using the Kinect with a very simple grammar. When the speech recognizer recognises the next (go) and previous (back) words I will transmit that text over the socket to the waiting metro app whereupon I will use them to activate commands. To make a useful (sort of) example I will create a Metro app which loads images from your pictures library into a flip view and use the voice commands to allow navigation of the pictures using ‘next’/"previous". Disclaimer: Please note that I haven’t tested this code beyond trying it in my development environment and it was not written to be robust in any way. do you think this kind of a metro app will be approved by MS?